In the creation myths of certain cultures, the world began as an egg, which broke open to form the earth and the sky. What if some intrepid explorer mounted an expedition to the ends of the earth and came back with fragments of the original eggshell, or maybe feathers from the bird that laid it? That’s what happened last week. Thanks to a group called BICEP2, which took a telescope to the South Pole and pointed it at a single patch of sky through three long Antarctic winters, we now have bits of eggshell providing strong evidence for our modern creation myth: the inflationary universe. Once upon a time, the entire universe we know today was packed into a tiny dot, much smaller than an atom—only a millionth of a billionth the size of a proton. With so much matter and energy confined in such a small space, gravity was a very powerful force, which you might think would hold everything together forever. But one day something odd happened. Inside the microdot universe, gravity suddenly changed its sign; it became a repulsive force instead of an attractive one. That repulsion is what put the bang in the big bang. The universe doubled in size in 10–37 second. Then it doubled again, and again. After about 100 doublings, the dot had expanded by a factor of 1028, and our universe had a diameter of 1 centimeter—the size of a marble. It was all over in a trillionth of a trillionth of a trillionth of a second, or thereabouts. Afterwards, gravity resumed its familiar, convivial, let’s-all-stick-together personality, and the rest of the history of the universe unfolded at a more stately pace over the next 13.8 billion years. Three decades ago, when I first read about (and wrote about) the inflationary universe, physics itself was in a bubbly, inflationary mood. Theorists, it seemed, couldn’t dream up an idea too outlandish for experimentalists to confirm. Let’s have three quarks for Muster Mark, decreed Murray Gell-Mann; sure enough, dense little quarky pits were found inside the proton and the neutron. We need a fourth quark—and let this one have charm—said Sheldon Glashow and his friends; and there it was in the J/ψ particle, discovered in 1974. Give us supermassive analogs of the massless photon, said Steven Weinberg and Abdus Salam; nature obliged with the W± and the Z0. Now and then, the theorists had to scramble to catch up with experiments, as when Leon Lederman found evidence for a fifth quark. On the other hand, a few theoretical predictions were way out in front of experimental prowess: Finding the Higgs boson took 50 years. Not every flight of fancy landed in Stockholm. Theorists asked experimenters to keep an eye out for decaying protons; they spent years looking and saw nothing. The magnetic monopole is still missing in action. Supersymmetry has not checked in yet. String theory remains… well, a theory. My own sentimental favorite was the preon or rishon model, a fantasy of recursive descent: If the proton is made of quarks, the quarks must be made of something still smaller. If only it were so. In that giddy era, Guth’s inflation conjecture was far from the wildest or weirdest idea to come along, but it did seem to be among the proposals that would be most difficult to test. Yet here we are with solid observational evidence. 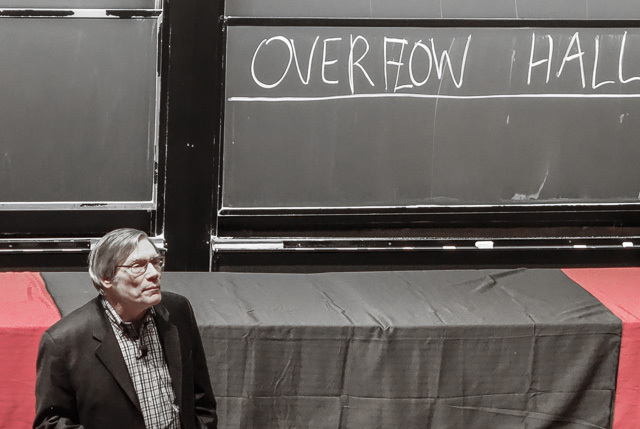 Guth’s talk on Tuesday was the first half of a double feature organized by the Harvard physics department. The second speaker was John Kovac, leader of the BICEP2 collaboration—the group that brought back the eggshells from the South Pole. Written on those eggshells was a distinctive pattern of polarization in the cosmic microwave background (CMB) radiation. The peculiar distribution of the CMB was one of the puzzles that led to the inflationary hypothesis in the first place. The CMB is al­most perfectly uniform across the entire sky, suggesting that whatever emitted the radiation must have been at a uniform temperature every­where. In a non-inflationary cosmology, that widespread thermal equilibrium seems mysterious. Distant regions of a very young universe are causally dis­connected: They have not yet had time to communicate with one another, even by signals moving at the speed of light. Some sort of miracle is needed to make all of these isolated regions so nearly uniform in temperature. Inflation dispenses with the miracle by squeezing the early universe into a much smaller volume, where all the parts can become throughly mixed. Inflation predicts a CMB that is nearly uniform, but not quite. Quantum fluctuations introduce variations in density and temperature, which become slightly warmer and cooler spots in the CMB radiation field. (Later in the history of the universe, the denser spots evolve into clusters of galaxies.) A series of satellite observatories has mapped the CMB with high precision, finding splotchy patterns with an angular size scale of about 1 degree, and temperature differences of 1 part in 100,000. These results are in good agreement with the predictions of inflation. This is encouraging news for the theory; on the other hand, inflation was invented to explain these very characteristics of the CMB, so there’s some circularity in the argument. Inflation makes another prediction. Quantum fluctuations in the high-density plasma of the inflating universe should give rise to powerful gravitational waves. These are propagating disturbances in the gravitational field, just as light waves are disturbances in the electromagnetic field. We are too late to detect the gravitational waves directly, but they should have left a distinctive signature in the microwave background—a swirly pattern of polarization, or wave alignment. If the inflationary scenario is correct, two modes of polarization should co-exist in the CMB; they are called the E-mode and the B-mode, after the E and B vector fields of electromagnetism. In the argot of vector calculus, the E field has divergence but no curl: Think of electric lines of force streaming radially away from a charged particle. The B field has curl but zero divergence, like the magnetic lines of force that wrap around a current-carrying conductor. E-mode polarization comes from a conventional process of photon-electron scattering. B-mode polarization is the mark of gravitational waves. The search for CMB polarization takes us to a rough neighborhood of the electromagnetic spectrum: the millimeter band, in the no man’s land between radio and optical wavelengths. Nearly anything can emit and absorb at these wavelengths, so it’s a noisy place. But astronomical signals are very faint because moisture in the atmosphere soaks up millimeter waves and not much gets through. I gather that the best place on earth to do millimeter-wave astronomy is the South Pole, which has exceptionally dry air and dark skies. In the past decade half a dozen millimeter-wave telescopes have been set up at the Amundsen-Scott South Pole Station. E-mode polarization was first detected in 2002 by one of these instruments, called DASI. BICEP2 was installed in 2009 to look for B-mode signals. 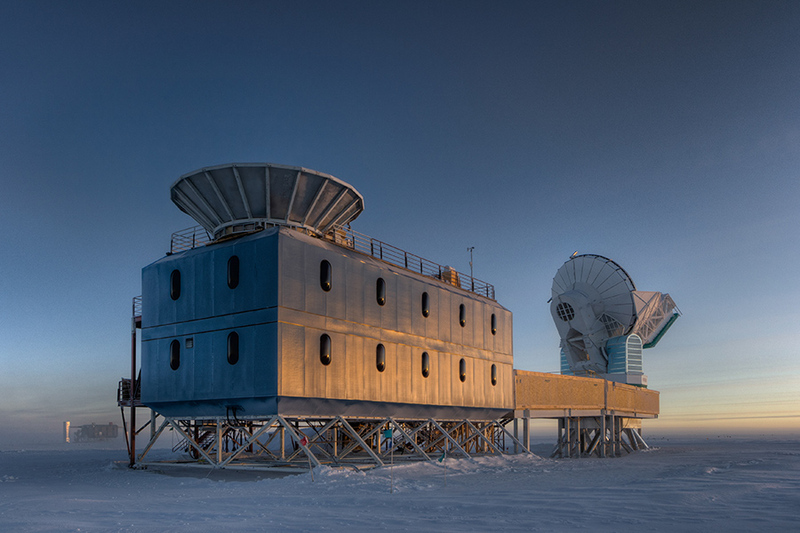 The BICEP2 telescope was operated at the Amundsen-Scott South Pole Station, on a platform located some 800 meters from the geographic pole. The telescope is inside the conical shield on the roof of the building; the shield blocks stray radiation from nearby sources. The instrument at right is the South Pole Telescope, which also operates at millimeter wavelengths. Just visible in the background at left is the IceCube neutrino telescope. Photograph by Steffen Richter, who spent three “nights” at the station (each night being six months long). Reproduced courtesy BICEP2 collaboration. The BICEP2 instrument is a curious hybrid of optical and radio technologies. The telescope is a refractor, with objective and eyepiece lenses—a design known to Galileo. But the lenses are not ground from optical glass; they are molded of high-density polyethylene (the material used to make plastic milk jugs). And the detector in the focal plane of the instrument is not the kind of imaging device seen in optical instruments; it is an array of tiny crossed antennas, etched into silicon wafers. The whole instrument is evacuated and cooled to liquid helium temperature. The detector is colder still: about 0.25 Kelvin. 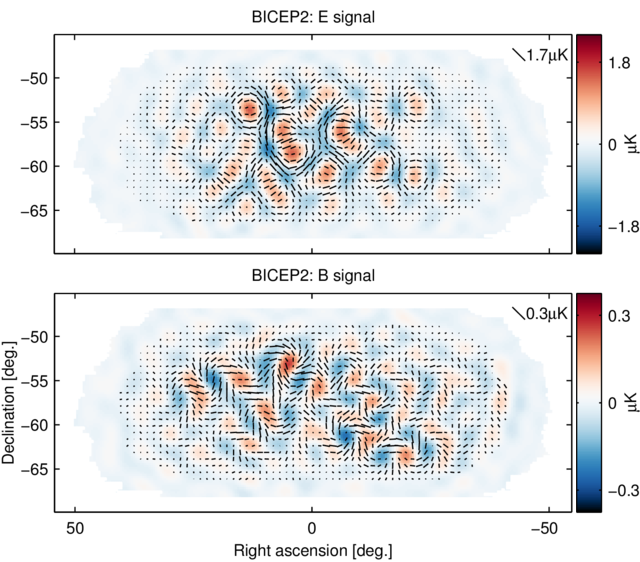 Polarization maps of the target area for BICEP2 reveal both E-mode and B-mode signals. E-mode polarization had been seen in earlier observations, but this is the first evidence of B-mode fluctuations, thought to result from gravitational waves in the inflationary era. Note that the intensity scale at right is six times larger for the E-mode map. Graphic reproduced courtesy BICEP2 collaboration. The important features of these vector maps are the pinwheels in the B signal panel. They are interpreted as the telltale remnant of gravitational waves. The BICEP2 group calculates that the B-mode signal is statistically significant at the 5σ level, which pretty much rules out the possibility of being fooled by mere random noise. More worrisome is the risk of some systematic error, such as a bias in the instrument, or polarization caused by non-cosmological sources, such as galactic dust. 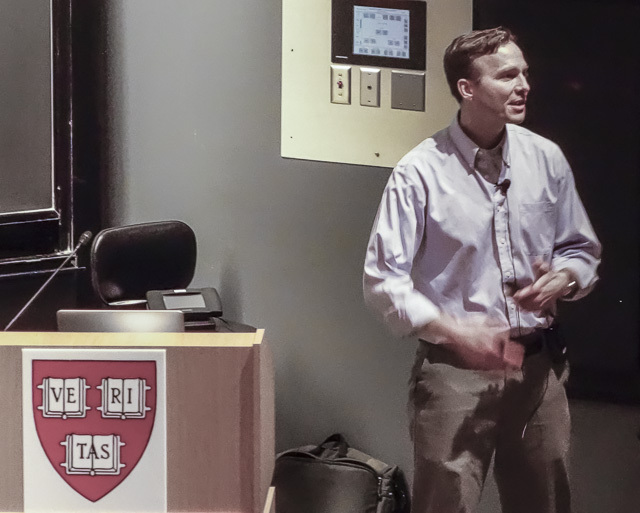 Kovac devoted much of his Harvard talk to these issues, and there is even more detailed discussion in two papers released on the BICEP web site. As far as I can tell, the checks for errors were very thorough and the evidence is very solid. In any case, we won’t have to wait another 30 years to see the result confirmed (or not). Another telescope, the Keck Array, is taking data now at the South Pole, and BICEP3 is being readied for installation. In case it’s not obvious already, let me say that I’m really wowed by this story. I think it’s a big deal. The discovery of the CMB in 1964 transformed the big bang model from a plausible possibility to a prevailing theory, and the discovery of B-mode polarization will surely do the same for inflation. To me it’s amazing that we can have such detailed knowledge of our most remote origins. A hundred years ago we knew nothing about the early universe. We didn’t even know that it had a beginning. We didn’t know how big it was or what it was made of. We had none of the conceptual tools that would prove essential to making sense of cosmic evolution: quantum field theory, general relativity, the nuclear chemistry that makes the stars shine. In one quick century it has all come together. Or not quite all. We still don’t know what the universe is made of. Most of it is apparently “dark matter” and “dark energy” that we have yet to identify; all the stuff we can see is a minor constituent. And we still don’t have a satisfactory quantum field theory for gravity. Yet, somehow, we can reconstruct the dynamics of the exotic, singular event that created this place, and supply enough quantitative detail to detect the evidence 13.8 billion years later. It’s magnificent. It’s ridiculous. This entry was posted in physics, science. First off, I wanted to say I enjoy your blog in general and I liked the feeling of amazement that you conveyed today. It is magnificent and it is ridiculous that we can detect such things. However, from a professional viewpoint I’d like to take issue with your paraphrasing of the idea behind inflation. You suggest that gravity somehow behaved differently in the early universe than now, which is not at all what inflation says (if it did, it really would be a weird theory). There is no “negative sign” or “repulsive gravity”, that’s just completely wrong. Instead, a correct understanding is that it turns out that, in general relativity, we get an equation that tells us that energy - all energy - causes the universe to expand. This equation is the Friedmann equation. Matter has energy, so the presence of matter actually sources the expansion of the universe. This happens at all times, during inflation as well as now. I guess this is the counter-intuitive thing, because we think of gravity as an attractive force and yet matter sources expansion, but that’s just the way general relativity is. But the thing with the energy density of normal matter is that, as the universe expands, it gets diluted because the same amount of stuff occupies a larger volume of space. This dilution means that the energy density of normal matter can’t drive accelerated expansion. But if the quantum vacuum itself has an energy density, this would not get diluted, because expansion produces more vacuum. It could be that a tiny residual vacuum energy is the dark energy driving acceleration today. It also turns out that under special circumstances a scalar field in the early universe can contribute an energy density that also doesn’t get diluted, leading to accelerated expansion then for some period of time (until those special circumstances stop existing). You may think this is a bit of a long-winded and pedantic comment. But the point I wanted to make was that gravity does not change behaviour in the theory of inflation. It carries on the same as it does today; what changes is the presence of a scalar field that exists (and has special properties) at very high energies. In this sense cosmology is telling us about particle physics that cannot be accessed by earth-based labs. In Newtonian physics gravity is always attractive, but it turns out that in general relativity gravity can and does sometimes behave repulsively. So the combination of general relativity and modern particle theory in fact predicts that at very high energy we expect there to be forms of matter that literally turn gravity on its head and cause gravity to become repulsive. A technical note here. According to general relativity, a repulsive gravitational field is produced by a material which has a negative pressure. A negative pressure is like a positive pressure but with the opposite sign [laughter]. Therefore you can think of a negative pressure as being like a suction. And furthermore it turns out there are states in particle physics—particularly states whose energy density is dominated by the potential energy of a scalar field—which have this property of having a large negative pressure, resulting in repulsive gravity. Actually, that is not really correct either. Nothing “sources the expansion”. The Friedmann-Lemaitre equation is time symmetric; physically, the universe could just as easily contract. It’s a differential equation. Whether we have expansion or contraction depends on the initial conditions.